I was quite happy with the old Performance but I must admit that the new algo is even better. With the new algo some darwins that were visible despite an awful equity curve now are getting the Score that deserve. Another thing I like is the increased weight of Performance in the calculation of D-Score. Sharpe Ratio - A Reliable Measure of Strategy Performance? We made some big changes in its calculation, and you are right it weights more in the D-Score. We will publish soon a precise explanation of the changes. 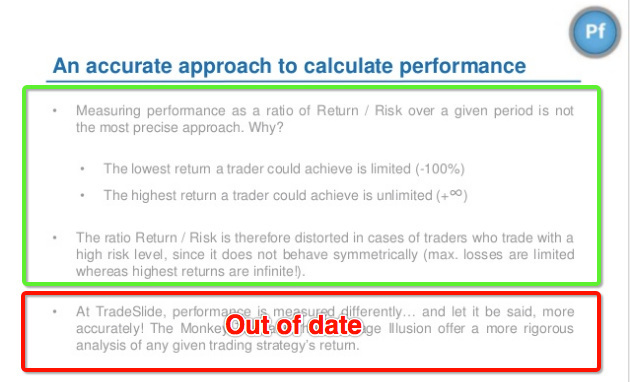 Intersting that nobody is speaking about Performance while it is one of the most important and efficent algos. Are there some articles to demonstrate that a monkey test is superior to classical rates derived from Return and Drawdown ? Why some do they preserve notes very high (higher than 8) whereas in loss since months (3P, 6P)? However this attribute is part of my 3 favourites to filter. Everything is calculated on 12 Dperiods, including Performance. The chart that matters can be seen clicking on Ex . It's really a good, surely the best with Rs to filter efficient darwins. I will add R- and La and you will have my best filter (demo account for moment). Edit: i would like to see a filter "Average winning trade/Average losing trade" (cause R+- and La doesn't indicate the same thing). ¨Average winning trade/Average losing trade¨ . I guess you know this information is in the platform under the Assets and Timeframes tab. However I believe it is useless at least you combine it with ¨% profit trades¨, both together will give you a better idea about the Darwin trading style and success. Thanks for the suggestion, @CavaliereVerde, I'll circulate this internally and revert to you! Performance is one of the most efficient algos. Touching it would be very difficult. We have also to consider that everything is calculated on 12 dperiods , so if you start to consider more than 12 dperiods for an algo you can unbalance DScore. People with short trackrecord would be happy with a lookback of 3 months, others would be happy with a lookback of 3 years. DScore rates your forward test, and 12 dperiods are a good forward test. Pf is already exponential, profit made 2 months ago weighs more than profit made 9 months ago. Are you sure about that? It seem to me it just depends on your percentile of 12P performance, compared to monkeys But in this case i am happy to be wrong. I think that here is quite clear that recent returns weigh more than past losses. Here is even more clear that recent DPeriods weigh more than far ones. Return and DD can be fooled by a lucky martingale or a manipulated inception. You cannot turn a loser to a winner with luck, only with hard work.